Goodreads says, "On her nineteenth birthday, Princess Kelsea Raleigh Glynn, raised in exile, sets out on a perilous journey back to the castle of her birth to ascend her rightful throne. Plain and serious, a girl who loves books and learning, Kelsea bears little resemblance to her mother, the vain and frivolous Queen Elyssa. But though she may be inexperienced and sheltered, Kelsea is not defenseless: Around her neck hangs the Tearling sapphire, a jewel of immense magical power; and accompanying her is the Queen’s Guard, a cadre of brave knights led by the enigmatic and dedicated Lazarus. Kelsea will need them all to survive a cabal of enemies who will use every weapon—from crimson-caped assassins to the darkest blood magic—to prevent her from wearing the crown. Despite her royal blood, Kelsea feels like nothing so much as an insecure girl, a child called upon to lead a people and a kingdom about which she knows almost nothing. But what she discovers in the capital will change everything, confronting her with horrors she never imagined. An act of singular daring will throw Kelsea’s kingdom into tumult, unleashing the vengeance of the tyrannical ruler of neighboring Mortmesne: the Red Queen, a sorceress possessed of the darkest magic. Now Kelsea will begin to discover whom among the servants, aristocracy, and her own guard she can trust. But the quest to save her kingdom and meet her destiny has only just begun—a wondrous journey of self-discovery and a trial by fire that will make her a legend…if she can survive." Kelsea lives in a very unsettled world where her mother, the queen, placed her in exile as a child for her protection. She grew up with foster parents that not only kept her safe, but also trained her to be the next queen and in turn, Kelsea grew up living a sheltered life without many friends. After her mother dies and once Kelsea comes of age, she needs to go to back to the castle to rule. The Queen's Guard accompanies her on the dangerous adventure back to the castle, as many people want to see her dead, including the current ruler in her absence….her uncle. The more Kelsea learns about the state of her kingdom, the more horrified she has become. Her uncle has let the kingdom become corrupt and the citizens are living in constant fear of the evil Red Queen thanks to the path of destruction she left behind. Kelsea must not only right her uncle's wrongs, but also decide whom to trust in this new and unpredictable world. 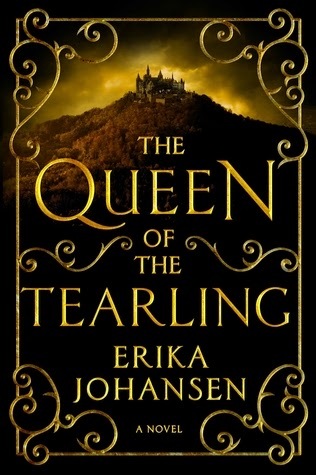 Erika Johansen's debut, The Queen of the Tearling, is an entertaining high fantasy that was quite the adventure. The setting of The Queen of Tearling is a bit confusing. It's a "new world" that possesses many characteristics of medieval times, but also makes references to technology. I was a bit confused by this and I wish Johansen gave us more background on the setting and spent some more effort in the world building department. However, the more I read this novel, the more I was reminded a bit of high fantasies that I enjoyed in the past, such as Tolkien's Lord of the Rings, Lloyd Alexander's Chronicles of Prydain series and even Martin's Game of Thrones. Like these other fictional worlds, Johansen's also includes some magical elements, which I thought was a nice touch. Kelsea is a captivating heroine who has a very difficult task of not only safely becoming queen, but also righting several wrongs imposed by her corrupt uncle. One of her first tasks in The Queen of the Tearling involves breaking a treaty with the neighboring Mortmense, which is ruled by the Red Queen. Breaking this treaty will ultimately put her kingdom in grave danger. I was constantly on the edge of my seat wondering what the Red Queen was going to do next. Johansen did a good job creating such an evil villain that I found repugnant and loved to hate. There's a ton of adventure in The Queen of the Tearling. If you love your high fantasies to be heavy on the adventure and light on the romance, then this novel is for you. I wish there was some more romance, but that didn't deter me from enjoying Kelsea's journey. I can see why Emma Watson would want to both star in and produce The Queen of the Tearling movie. It has the potential to delight fans of this genre and I know I'm going to keep my eye out for book two in the series, which I believe comes out next year. I keep forgetting that they're making this into a movie! I can't wait to read this one! And I see you're reading Trial By Fire, I'm currently listening to the audio book version. How do you like it so far? I am definitely excited to see it on the big screen! And yes, Trial by Fire was entertaining, but not my favorite. I liked her Starcrossed series just a little bit more. Thanks for visiting, Amber! I have this one checked out from the library and look forward to reading it. Did you picture Emma Watson as Kelsea when you were reading? YES! I love Emma Watson and I think she would do a great job as Kelsea. I think you'll like the read, Christina, although it is a little light on the romance, it was still pretty great! Thanks for visiting!